Over the years, we’ve released a number of items that are just for fun—things that let you show off or role-play outside of combat. But having them clutter your bags—and needing to open your inventory to use them—isn’t ideal. To address that, we’ve added a novelties section to the wardrobe. Now you’ll be able to quickly access these items on any of your characters and equip them easily without having to shuffle them around. You can transfer a novelty to your wardrobe the same way you do existing unlockable items: right-click on it and select Add to Account Wardrobe. This will transfer it safely from your inventory to your Hero panel. There—now all of your characters have access to it! Then open the Hero panel, select Novelties in the equipment tab, equip your items in the various slots, and use the button on the lower-right side of your skill bar to take them out. For quicker access, you can bind a key for each novelty slot. Adding a distinct novelties category to the wardrobe let us clean up a lot of inconsistencies in how they work. We haven’t made any changes to major item functionality, but you may notice slight differences in some items’ behaviors after transferring them to your wardrobe. Everyone deserves to sit back and relax once in a while, and now your characters can do that whenever they like. In addition to the Bench of the Final Judge from the Hall of Chains raid, you can earn a simpler chair by completing the Chairs of the World achievement. 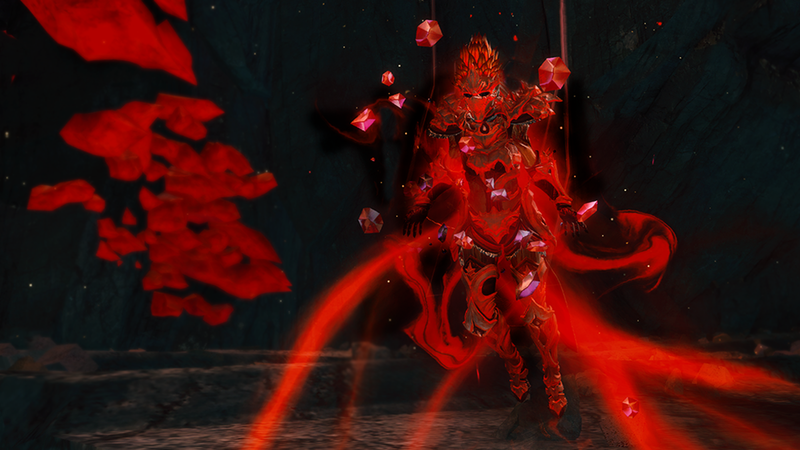 If you’ve already completed the achievement, speak to Sarettokk in Lion’s Arch to pick up your chair. 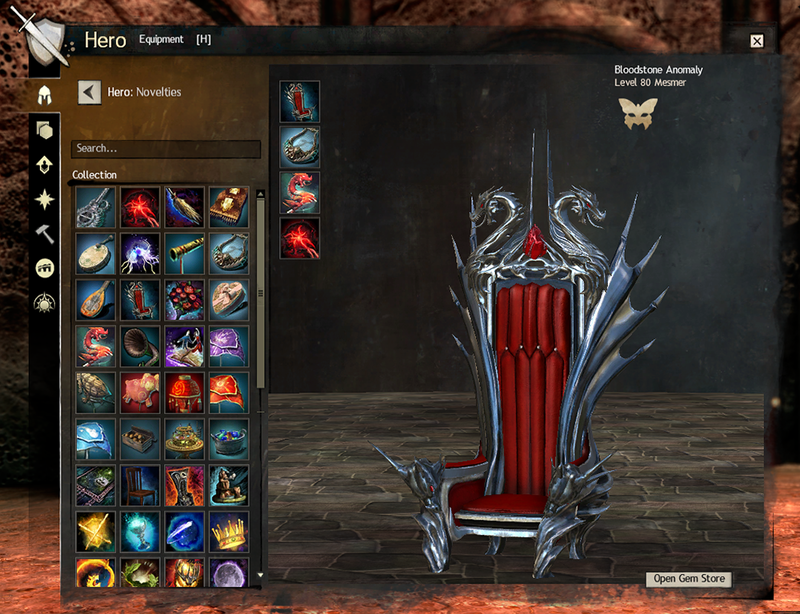 A new Emblazoned Dragon Throne is now available from the Black Lion Trading Company. Keep an eye out for more chairs in the future. Whether you prefer the dulcet tones of a flute or the deep rhythms of a bass guitar, we wanted to make it as quick and easy as possible for you to pull out your favorite instrument and strike up a tune. 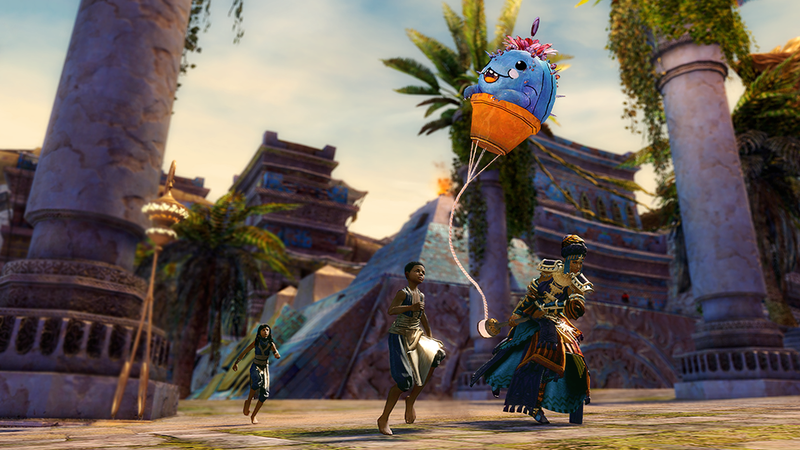 Whether you’re flying your favorite kite in the verdant fields of Queensdale or presenting a rose to the one you love, equip held items to this slot to have them close at hand. This category encompasses fun items that defy easy classification, like the Zephyr Sanctum Model, Bobblehead Laboratory, and Riding Broom. If you’re tired of being told to clean your room, sweep them all into your wardrobe. We didn’t forget about them! The number of tonics to be converted to the wardrobe was pretty daunting, but rest assured that work is well underway. As soon as we’ve made sure everything’s in working order, we’ll add a fifth slot for endless tonics.